Adam Scott plays the 2014 Players Championship. 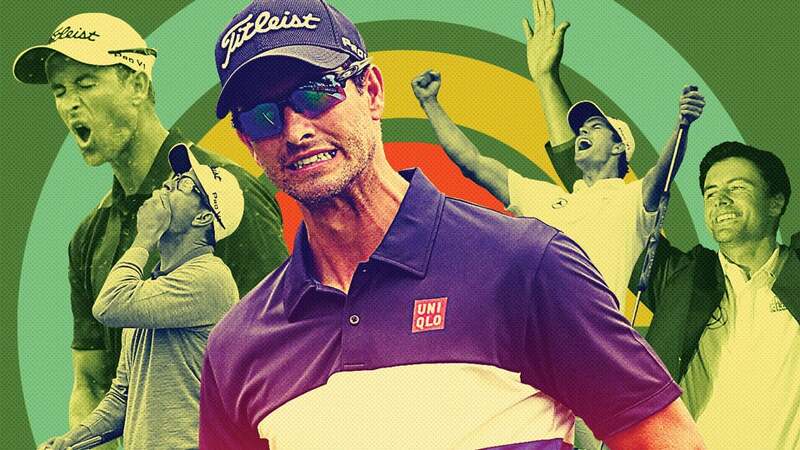 PONTE VEDRA BEACH, Fla. - Adam Scott's wedding was so secret that not even his guests knew about it. One day after the former Masters champion revealed he married Swedish architect Marie Kojzar in the Bahamas, he shared a few details about how he kept the wedding a surprise — and how he managed to go three months before anyone found out. The parents were aware, and not many more. U.S. Open champion Justin Rose, one of his best friends, was invited to a party but didn't attend. He didn't know it was a wedding. "We just said we were having a party, so come on over," Scott said. "So then they had no idea that it was going to happen. So that was the fun little game for me and Marie to play for a while, planning it and stuff." They were married April 17, the Thursday after the Australian tied for 14th at the Masters. For being one of the most popular players in the game, Scott doesn't seek a lot of attention. Hardly anyone sees him when he's not playing golf. He typically retreats to his home in the Bahamas or in Switzerland. After becoming the first Australian to win the Masters, he waited until the end of the year to return home to Queensland. Rory McIlroy announced his engagement on New Year's Eve. He was asked if he would wait a month before he told anyone he was married. "No, but Adam is a little different than me," McIlroy said. "We knew. I don't know how he kept it a secret for so long from you guys. I had breakfast with him this morning. It was nice to be able congratulate him. He was telling me he had to tell lie after lie just to keep it quiet." Scott said that part wasn't planned. "We just wanted it to be a secret for the day, and then we haven't told anyone to keep it a secret since," he said. "But I think people didn't want to do the wrong thing by me. So I've got them right where I want them." He has not played since the Masters, keeping to the same schedule as last year. When he showed up at The Players Championship, he was not wearing a ring. "We have rings, but I've never played with one, so I wasn't going to start this week," Scott said. "We'll see if it makes it to the course or not." Scott's bride did not travel to a lot of golf tournaments when they first were dating more than a decade ago, and he said that probably wouldn't change. Several in the crowd called out congratulations to him throughout the third round. The golf wasn't bad, either. Scott got off to a rough start Saturday and finished strong for a 69. He was 3-under par, still with an outside chance at finishing high enough to replace Tiger Woods at No. 1 in the world ranking next week. He said there wasn't a proposal — it was more like a conversation. As for a honeymoon? They live part of the year in a place most couples go for their honeymoon. "We figured we didn't need a honeymoon — our life is pretty much like a honeymoon all the time," he said. "So there were no real plans for any of that. We'll just keep on going."